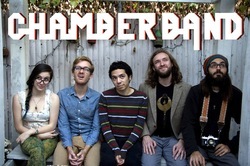 Sounding equal parts The Decemberists and Coheed and Cambria (by way of Danny Elfman), Chamber Band -- a name taken ironically, we're told -- endlessly strives to strike the right balance between playing no-frills indie rock and telling a good goddamn story. The Brooklyn five-hander has a propensity towards keeping it brief, burning through their jams with hooky, minimalist musicality, stopping only to guzzle their drinks or poll the audience about "where the Catan at." They're currently playing and promoting their debut album, Deities -- eleven sticky tracks about love and heartbreak in the world of Dungeons & Dragons.